Innovative App development company My-Mo are blazing a trail in the waste management industry with a range of new smartphone based recycling apps. Describing themselves as ‘Premium Cross Platform Mobile Application Developers’, My-Mo have turned their technical expertise towards helping councils such as Maidstone and Ashford improve their offerings. Residents are now able to use the latest technology to find out relevant local information connected to recycling and rubbish collection. This new service also allows users to report a range of issues including fly tipping and dog fouling. Ashford Council is the latest to follow in Maidstone’s footsteps after the Department for Environment, Food and Rural Affairs (DEFRA) cited it as having the worst recycling rates in the UK. A study found that Ashford council was only recycling 14% of it’s waste, compared with the best performing areas such as Tunbridge Wells, which recycles 45% on average. The new My-Mo apps offer a dynamic interface between customers and waste collectors, ensuring that residents have fingertip access to information on recycling best practice, collection days and collection types. Waste management companies can add collections, postcodes, addresses and so on in real time, ensuring that all information is current. The app also offers a reporting system for customers, enabling them to flag incorrect collection days, missed collections, lost or stolen bins and other service issues. All requests are autmatically sent on to the waste company for resolution. The My-Mo App comprises several key features, including a reminders function. This enables the customer to set automated collection reminders for various waste streams – for example some areas may only collect dry mixed recycling on a Tuesday. The customer could then set a reminder to put the appropriate bin out at 9am in the morning. The app also features Google Maps functionality, enabling customers to see where their nearest recycling points are for certain types of waste and obtain driving directions. My-Mo have incorporated an educational element to the app, introducing a bardcode reader that enables customers to scan products. The app can then tell the customer what the ideal waste stream for the particular item is from a recycling perspective. The app also makes full use of both the camera and GPS functions, enabling users to take photos of incidents such as spillages, bin fires and abandoned vehicles before tagging the location and uploading. Recycle for Maidstone is now available in the App Store and Android Market Place. 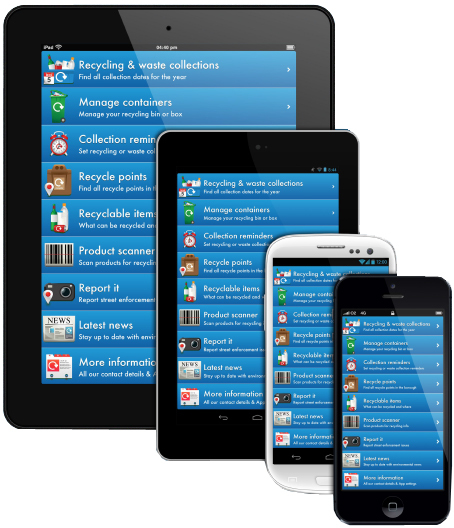 Recycle for Ashford is also available for iOS and Android. If you’d like a free quote on your waste collections, please visit this link, complete the short form and we’ll be in touch!